Kicking off the Grey Mardi Gras is the Stomp, Jive & Bump Buffet Dinner Dance from 6pm - 10pm on Friday 12 April at the Cobar Memorial Services Club. It’s a night to really test your love of the golden eras, with 1950s, 60s, and 70s fashion prizes up for grabs, golden era trivia, and a themed two-course buffet dinner. Creating the vibe for the night is live entertainment performed by The Local Kids, and group dance sessions lead by the Western Studio of Performing Arts. Take home a memento from the night with snaps from the photo booth. If a Ticket Buyer breaches or does not fulfil any of the obligations outlined in these Ticket Terms and Conditions, and Entry Conditions, Event Organisers retain the right to confiscate items, evict them and/or remove ticket wristbands. The term ‘Ticket Buyer’ refers to the customer/ticket holder. The term ‘Event Organiser’ refers to Cobar Shire Council (ABN 71 579 717 155). This ‘agreement’ means the purchase of one or more tickets for entry into the 2019 Cobar Grey Mardi Gras or “Festival”, and it includes these Ticket Purchase Terms (“the Terms”) and other documents referred to in the Terms. The agreement is deemed to be entered into in New South Wales (NSW), Australia. This agreement is governed by the laws of NSW. All tickets are non-refundable except in accordance with the laws of NSW or as expressly specified in the Terms. The Festival is an all-weather event and will proceed rain, hail or shine. Ticket Buyers should assume the event is going ahead, unless advised otherwise by the Event Organiser or 123Tix. No refunds will be made if the Ticket Buyer chooses not to attend due to inclement weather. If the Festival is cancelled by an act of God, or any other reason outside of our control, there is no obligation to arrange a substitute Festival. Ticket Buyers will be offered a refund for the face value of the ticket purchased. Event Organisers reserve the right to cancel or postpone the Festival for any reason within their control. In this case, Ticket Buyers will be offered a refund for the face value of the ticket purchased. In the very unlikely event that these ticketed events are cancelled or post-poned the Ticket Buyer, will be notified via text message and email using the details provided. Announcements will also be made via the Cobar Grey Mardi Gras website and Facebook page. There will be no refund on any unused portion of tickets if a Ticket Buyer is asked or forced to leave, or if a Ticket Buyers decides not to attend any part of the Festival. Event Organisers reserve the right to add, withdraw, reschedule or substitute artists and may vary advertised programs, prices, venues or seating arrangements. No refunds will be made in this case. To the fullest extent permitted by law, the Event Organiser does not accept liability of any nature for the acts, omissions or default of those providing services in connection with the Festival, or any liability for any injury, damage, loss, delay or additional expenses which are incurred at or in association with this event, regardless of the cause (including negligence). For any condition or warranty imposed by legislation which cannot be excluded or modified, liability for any breach of such condition or warranty will be limited, at the Event Organisers option, to the resupply of the services, the cost of having the services supplied again, or the refund of the money paid for the ticket. In no event will the Event Organiser be liable for any indirect, consequential, exemplary or special damages. Persons aged 18-30 years will be required to show Photo ID on entry. Adults aged 31 years and over should also be prepared to show Photo ID before receiving an 18+ wristband. Pension and Seniors Concession Card holders must show their current ID card on entry into the Festival areas, or entry will be refused or, in our discretion, allowed upon payment of the difference between the pension card price and full price of the ticket. Dependents listing on a Pension Concession Card are not deemed pension card holders and will need to purchase a full price ticket. Tickets will be redeemed once only at the door/gate. Wristbands will be issued for a number of events. If a wristband is issued, Ticket Buyers must wear their band for the duration of the ticketed event. Wristbands are non-transferable. Broken wrist bands will not be honoured. Entry may be refused if tickets are damaged or defaced in any way or are not purchased through an authorised point of sale. If a fraudulent ticket is presented the matter will be referred to NSW Police Service. Ticket Buyers are permitted to bring their own food and beverages, including alcohol into the Festival providing they adhere to the other Entry Conditions (NO GLASS). Water and soft drinks will be available for purchase, as will a small variety of food on the day. It may be a condition of entry to the Festival that a search of your person and/or your possessions is required at the time of entry to the venue. No glass, umbrellas, shade tents, fire/fireworks, video and audio recording devices (other than mobile phones and tablets), including GoPros professional still cameras, selfie sticks or any item prohibited by law are permitted within the Festival. Refusal to consent to a search will prevent entry to the Event, without refund. Fold-up chairs may be brought into outdoor Festival areas, unless otherwise signed, but must be kept in the back half of the area. Event Organisers may direct Ticket Buyers to move or remove chairs from the Festival for any reason. Pets (dogs) are permitted to attend the Saturday night Concert (April 13) providing they are on a short leash and under the supervision of their owner at all times. If an issue arises during the course of the event, the Event Organiser may request that the owner take their pet home. Grassed areas may not be reserved through the placement of blankets or chairs. Event Organisers reserve the right to remove any unattended blankets or chairs. Please be aware that the Gig on the Grass – Concert @ Ward Oval will be held outdoors and as a result it is exposed to the elements. Grass, gravel and uneven surfaces may be found on the festival site. 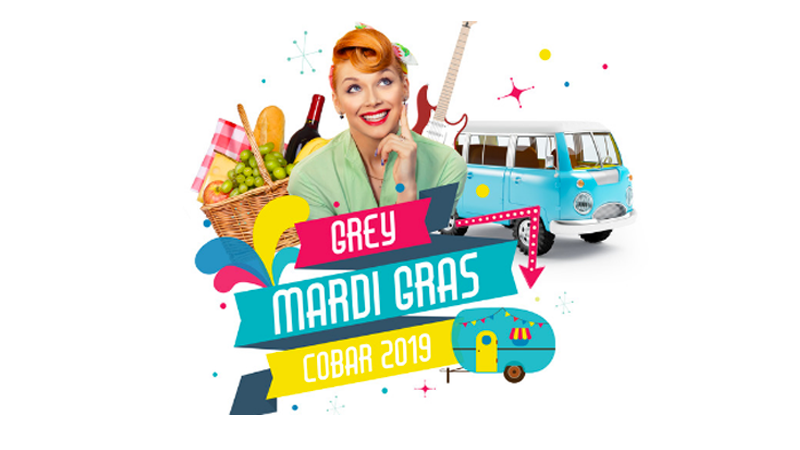 Ticket Buyers who require assistance during the Concert should contact security or a member of the friendly Cobar Grey Mardi Gras team. Ticket Buyers must wear footwear at all times. Children may be asked to remove their footwear on the jumping castle, other. Ticket Buyers are encouraged to come prepared for wet and/or unfavourable weather should it be forecast. Please note umbrellas will not be permitted at the Concert. Ticket Buyers are only permitted to smoke in Designated Outdoor Smoking Areas. No food or drink is to be consumed in these areas. Any Ticket Buyers found buying alcohol for or supplying alcohol to a minor will be evicted from the venue and face criminal charges. Any Ticket Buyers found consuming or supplying illicit drugs will be evicted from the premises and face criminal charges. Ticket Buyers consent to being included in any photography, film and/or sound recordings of the Festival or its surrounds and for these recordings to be used by the Event Organiser for any future Festival marketing and promotional purposes. Event Organisers will not be responsible for any loss or damage to the property (including personal property such as bags, money or other personal items) Ticket Buyers purchase or bring to the Festival. Entry is at the Ticket Buyers own risk and the right to refuse entry is reserved. Ticket Buyers are liable for any loss or damage they cause at the Festival. Ticket Buyers must act in an orderly manner when attending the Festival. Event Organisers may refuse entry or evict Ticket Buyers if they are behaving in a disorderly, offensive or inappropriate manner, or if they breach the Entry Conditions. Be waste and water wise, and respect nearby residences. Ticket Buyers must place litter in the bins provided around the venue/s, and re discouraged from creating excessive noise while travelling to and from the Festival.